I do not know how my sweet sister Jessica manages to love life with all her food restrictions. She has type 1 diabetes, which makes sugar something she has to watch carefully. She also has Celiac Disease, which rules out pretty much all breads, grains & baked goods. Recently she discovered that she’s allergic to dairy – her one luxury left. No more cheese, butter, yogurt etc. Ugh. Poor poor Jessie. She handles it all like a total trooper though – she’s really just an amazing person. If I had to deal with all the food issues she does, I would probably crawl into a closet and just sob quietly to myself for hours on end. Especially the cheese. Take all the other stuff away, but don’t take cheese. Or butter. Yeah, I don’t want to live without butter either. Many gluten-free cookie recipes have strange combos of rice flour & xanthan gum in place of all-purpose flour. Those flours run around $8 for a 2 pound bag, which is just crazy prohibitive to me. This is the first recipe I’ve seen that doesn’t have crazy flours or butter/milk – which makes them both Jessica friendly and easy on my wallet! Oh joy! My cousin posted this on her blog the other day and lucky me (or should I say lucky Jessica? ), we’re getting together for a family fiesta tonight! 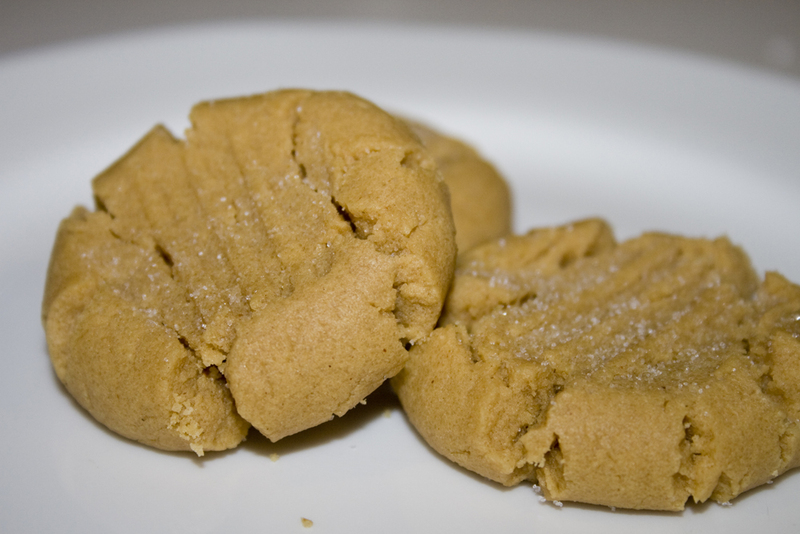 I know peanut butter cookies aren’t exactly Mexican fare, but I decided to bring these anyway. They are surprisingly delicious. I tried one of my cousin’s batch and was amazed at their moist peanutty taste. Very very good. My highly trained palette could taste a hint of the baking soda though, so I added a little vanilla extract to help mask it. I also rolled them in sugar before flattening. Make sure you flatten them as the dough doesn’t really change shape from what it looks like unbaked. These are kid tested and approved! My munchkins gobbled them up fresh out of the oven and were begging for more. I wouldn’t trade my normal peanut butter cookie recipe for these, but if you have a loved one with gluten/dairy issues, these are fantastic! DIRECTIONS:Preheat oven to 325°. Cream all ingredients in a mixer. Roll into one inch balls. Roll dough balls in sugar, place on an ungreased cookie sheet & flatten with a fork. Bake 8-10 minutes and cool on cookie sheet until completely cool. I just checked – these are definitely a breakfast cookie. 🙂 YUM. You and Shan’s blogs are teaching me to love my kitchen. We make these too, but its just the 1 egg, 1 cup peanut butter, and 1 cup sugar. That is it. I also, sugar the fork and flatten, but that is it. They are the easiest cookies EVER!!! The first ones I made for us tha were gluten free and dairy free. These are still our go to cookies and sooooo simple. Indeed! So simple and a perfect GF alternative. We have to watch our kids’ sugar intake. Can I substitute honey for the sugar? Well I made them and used honey and while they have good flavor they are not solid enough to roll into balls and look nothing like the yummy ones in your pics :(. Could the honey really have made that much of a difference? Honey is much less solid than sugar. It is moisture rich as well. Sorry to hear it didn’t work for you with the substitution. It’s worth a try. Let me know how it turns out! Aren’t they great?! I love when I find things that are every bit as good as their “normal” food counterpart! How are they gluten/dairy free when it call for one egg? Egg actually isn’t dairy. Folks who have a dairy allergy can eat eggs. Now, some people are also allergic to eggs, and these cookies aren’t vegan because of the egg. But they are dairy and gluten free.